The Greek Parliament on Saturday rejected a censure motion against the government, with 153 votes against the motion and 127 votes in favour out of a total 280 votes cast, following a heated two-day debate. Foreign Minister Nikos Kotzias submitted declassified ministry documents showing that while New Democracy criticized government’s negotiating tactics on the name issue, it had accepted in the course of previous negotiations much worse proposals. Before the vote, approximately 5,000 protesters gathered outside the Greek Parliament. Riot police fired tear gas at one point to disperse ultra rightist demonstrators who tried to enter the building. Announcing the vote, the presidency also read out a letter from the head of the junior partner in the coalition government, Independent Greeks (ANEL) leader Panos Kammenos, who announced that the MP Dimitris Kammenos has been expelled from ANEL’s parliamentary group. Earlier, Dimitris Kammenos had voted in favour of the censure motion in parliament. In addition to the opposition party MPs, the motion was also supported by independent MP Giorgos Katsantonis. Three independent MPs were absent from the session while parliamentary group of the Communist Party of Greece (KKE) had walked out of the debate, as had Golden Dawn MP Yiannis Sahinidis. In a ceremony replete with symbolism, Greek Prime Minister Alexis Tsipras and his counterpart from the Former Yugoslav Republic of Macedonia (FYROM) Zoran Zaev will meet in the Prespes lake district on Sunday, June 17, to sign the agreement that may end a decades-long dispute between their countries and lead to the renaming of Greece’s northern neighbour, as well as its EU and NATO entry. Tsipras is due to arrive in Prespes, the lake where the borders of Greece, Albania and FYROM meet, at 10:30 on Sunday, at the village Psarades on its shore. With him will be Foreign Minister Nikos Kotzias, the United Nations Secretary General’s special envoy for the name dispute Matthew Nimetz, EU High Representative for Foreign Affairs and Security Policy Federica Mogherini, European Commissioner for Enlargement Johannes Hahn and the representative of UN Secretary-General Antonio Guterres, Under-Secretary-General for Political Affairs Rosemary DiCarlo. Zaev will be arriving by boat, if the weather permits, with FYROM’s Foreign Minister Nikola Dimitrov, or via the new border crossing by road. Tsipras and the other officials will meet them at the marina and then walk to a specially prepared raised platform that will be set up, complete with a tent in case of bad weather. The signing of the agreement will take place on this platform, by the foreign ministers of the two countries and Nimetz, in a special ceremony, following an address by Tsipras and Zaev. After the agreement is signed, the two prime ministers, foreign ministers and official guests will board water craft and sail to a town on the opposite shore of the lake in FYROM, where they will have lunch. With developments coming fast and thick, both in connection with economic issues and with the agreement to resolve the name dispute, Greece might be described as going through historic times, Prime Minister Alexis Tsipras noted as he addressed parliament on Saturday, wrapping up the debate on the censure motion against the government. “The country has agreed with the Former Yugoslav Republic of Macedonia (FYROM) for a final resolution of a dispute that has lasted three decades. It has sealed Greece’s passage from a period of economic weakness and international isolation to a time of dynamic economic recovery and a strengthening of its international position,” he said. At this very positive time for the country, Tsipras added, he found it sincerely difficult to understand why the main opposition had chosen this moment to try to topple the government, using its most powerful institutional weapon. In its proposal, the prime minister added, the main opposition had no interest in either the country’s international position or the restoration of Greece’s leading role in the Balkans, or even in the recovery of the economy and a final agreement on the debt. “All you seek is the fall of the government before the country finalises its exit from the programme to which you led it,” Tsipras said, addressing ND. “You know that the start of a new age for the country is the beginning of the countdown for your political plan,” he added, calling ND leader Kyriakos Mitsotakis a “political opportunist”. 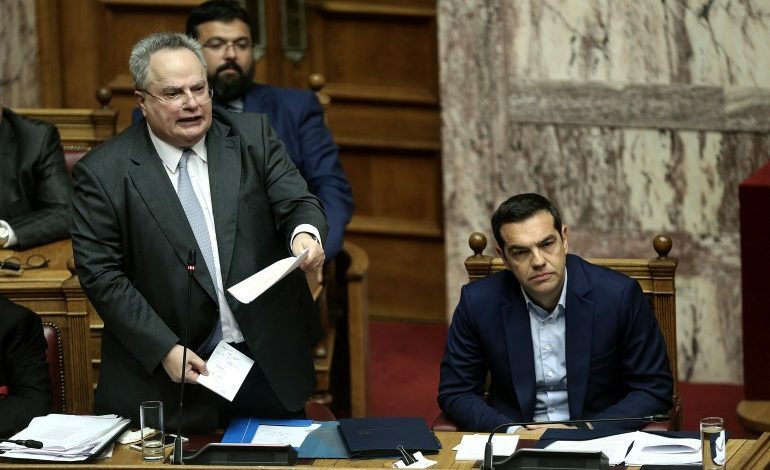 Responding to opposition criticism that the Athens-Skopje agreement “divided the Greeks to unite the Skopjans”, Tsipras pointed out that the exact same argument was being used by nationalist elements in the neighbouring country against the country’s Prime Minister, Zoran Zaev. “With your irresponsible stance on the name issue, you chose to open Pandora’s Box,” Tsipras noted. “You gave legitimacy to the extreme, incendiary arguments and to extreme nationalist terminology in order to fish in the murky waters of the nationalist audience,” he said, noting that Mitsotakis had failed to condemn nationalism in his speech. “You allowed your MPs, if you did not actually encourage them, to talk of traitors and high treason, with the result that you left the backdoor wide open to the nationalist stench of Golden Dawn,” the prime minister added, accusing ND’s leader of being a hostage of the far-right of his party and of former premier Antonis Samaras. “It not only includes a compound name with a geographic qualifier, used erga omnes, but also sets as a condition a change of the constitutional name by which the country has been recognised by 140 countries. It includes a constitutional change to eradicate every irredentist term in their constitution,” Tsipras pointed out. He further highlighted the other side’s obligation to clearly differentiate the ancient Greek Macedonian heritage from that of Greece’s northern neighbour, stating that the two were not related, and make relevant changes to monuments, documents and inscriptions – including giving up the Star of Vergina symbol. “Your problem is not that this is a bad agreement. It is that we have an agreement and, even worse for you, that it is a good agreement…you don’t want this government to succeed where yours have failed,” he said, addressing the opposition. Defending the agreement that he negotiated with the government in Skopje over the name issue, Foreign Minister Nikos Kotzias on Saturday said his critics were failing to acknowledge the major concessions made by Greece’s northern neighbour under the deal. The foreign minister was speaking in parliament, during the debate on the censure motion tabled by main opposition New Democracy. “Is it a small thing for a country to change its name? Is it a small thing for it to change its Constitution,” he asked lawmakers, noting that, in return for these major acts relating to its neighbours’ identity, Greece would have to simply ratify the agreement. To those criticising him for presenting the deal as a “faits accomplis”, meanwhile, he pointed out that such “faits accomplis” had accompanied this issue throughout its 27-year history, if not its 70-year history. Compromise was inevitable in negotiations, Kotzias pointed out, unless one had won a war, while noting that the present negotiation had been based “on what we found”. “No, the international agreement is progress. It is much better than the state that we found. New Democracy governed for 10 years in the time that negotiations on the Skopje issue were taking place, with seven ministers, and even now they will not tell us their position,” he said. The government must now answer for the ills it has inflicted on the country, culminating in the ‘fourth memorandum’ and the agreement on the name issue, main opposition New Democracy President Kyriakos Mitsotakis said on Saturday. “This why we are here; to stop you,” he said, during the debate on the censure motion over the Athens-Skopje deal tabled by his party in parliament. Criticising the agreement reached on the name dispute, Mitsotakis said that this would start generating results from the moment it was signed. Once the 27 NATO countries had voted in favour of FYROM joining, it would be hard for Greece to say no, he pointed out. He also accused the prime minister of “trading” an agreement on the name with greater help on the economic front. 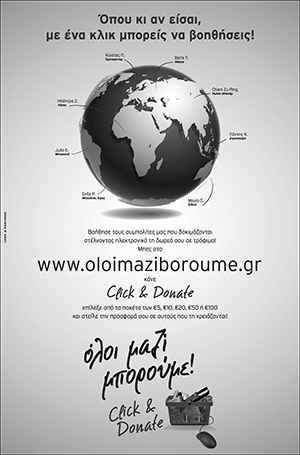 “We are here to unite and not divide the Greeks. It is clear that Tsipras sought a solution to the Skopje issue without red lines…erga omnes and the constitution were raised by ND,” he said. And while Greece’s northern neighbour would get a geographic qualifier, its residents would be Macedonians speaking Macedonian, Mitsotakis added, noting that the deal not only legitimised but actually strengthened irredentism in that country. “The elections are a few months away and the people’s judgement will put things in their place. You, Mr. Tsipras, will go down as the worst prime minister,” Mitsotakis said, adding that the ‘fourth memorandum’ and the Skopje agreement were “minefields” for the country’s future. “You have given up everything. You capitulated on everything,” former Greek premier and main opposition New Democracy MP Antonis Samaras said on Saturday, addressing parliament during a censure motion called by his party over the Athens-Skopje deal on the name issue. “You are signing a monstrosity of an agreement that, instead of solving the problems, will act as a trigger for destabilisation,” Samaras warned the government, accusing it of using the name issue to cause division within ND. He also criticised President of the Republic Prokopios Pavlopoulos, saying that the institution of the presidency did not have the right to judge “open political issues”. “We, the Greek people and their political parties, in spite of all the disagreements that naturally exist, have never given legitimacy to [FYROM’s] irredentism. This is exactly what you are doing now. I repeat: I have alway been opposed to a name that includes the word ‘Macedonia’,” Samaras said. Among his objections to the proposed agreement was its recognition of a “Macedonian” nationality and language, the three different alternative forms of describing the nationality, which he said was contrary to its erga omnes application, and the restrictions it would place on Greece, including a possible change of books etc. Following the serious criminal charges filed against him over his statements in parliament, in which he effectively urged the military to topple the government, Golden Dawn MP Kostas Barbaroussis escaped arrest by fleeing in a black parliament-issue Volvo, police reported on Saturday. He was accused of high treason, following a call to the Greek Military to organize a coup. Golden Dawn stripped him off his membership.